NEW ORLEANS — To see Basquiat and the Bayou, the “exhibition within an exhibition” that by general consensus is the must-see component of the sprawling Prospect.3: Notes for Now biennial triennial that opened in New Orleans on October 25, you need to make your way to the top floor of the Ogden Museum of Southern Art in the city’s Warehouse Arts District. The Ogden’s handsome brick and glass building sits across the street from the Contemporary Arts Center and is adjacent to the Louisiana Civil War Museum, formerly known as the Confederate Museum; the National World War II museum occupies a seemingly ever-expanding constellation of buildings in its own campus across the street. 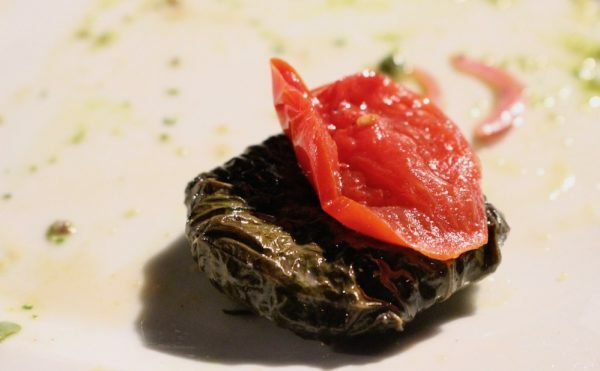 It’s a fertile setting for what turns out to be a provocative contextualizing of the artist’s work. Curated by Prospect.3 artistic director Franklin Sirmans, who also co-curated the 2005 retrospective of Basquiat’s work that originated at the Brooklyn Museum, the nine paintings in Basquiat and the Bayou present a compact survey of various themes related to the American South — including jazz music, slavery and its legacy, race relations, and Afro-Caribbean influences — that the artist explored over the course of his brief career. Only one painting here references New Orleans directly: “King Zulu” (1986), on loan from the Museu d’Art Contemporani de Barcelona, is an homage to Louis Armstrong, who was born in New Orleans in 1901 and returned to his hometown in 1949 to reign as King Zulu, or honorary leader of the city’s oldest and most prestigious African-American carnival organization, or krewe. Members of the Zulu Social Aid and Pleasure Club, as it’s formally known, are drawn from an upper echelon of prominent business and community leaders, and Armstrong himself considered his reign as King Zulu to be the fulfillment of a childhood dream. But the parade has always presented a curious spectacle to outsiders not familiar with New Orleans carnival traditions: Zulu krewe members parade in an exaggerated blackface costume, complete with spears and grass skirts, and pass out highly coveted decorated coconuts to delighted crowds of both black and white spectators along the way. Is Basquiat’s depiction of Armstrong in blackface, then, an acknowledgement of the honor that Armstrong was accorded as King Zulu, or the outsider’s critical reaction to a seemingly racist tradition? 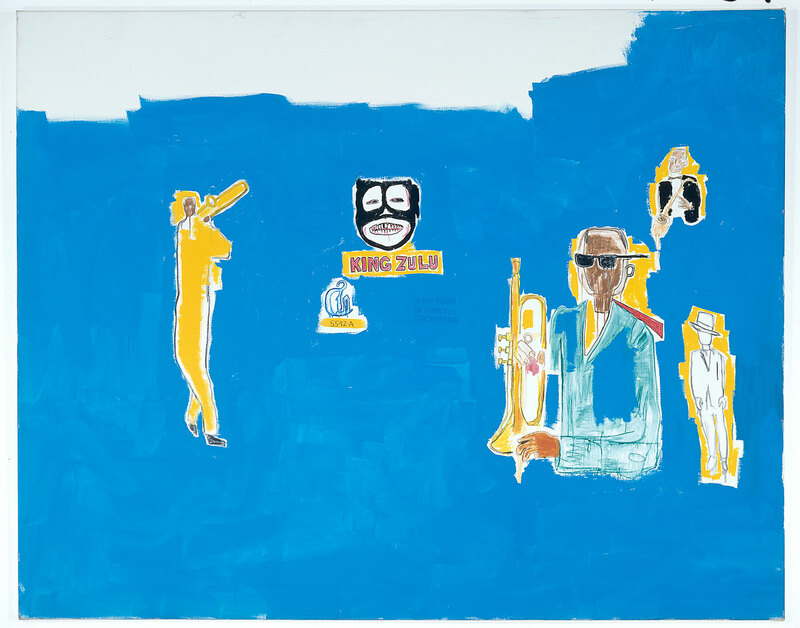 As is often the case with the best of Basquiat’s work, the painting offers no easy reading one way or the other, and the spectacle of Armstrong’s garishly made up face and leering grin floating serenely in a sea of blue with the honorific “King Zulu” and a four-piece jazz ensemble hovering around him remains an ambiguous one. Ambiguity also plays a part in the largest piece in the show, the massive “Zydeco” (1984) on loan from the Bischofberger Collection. 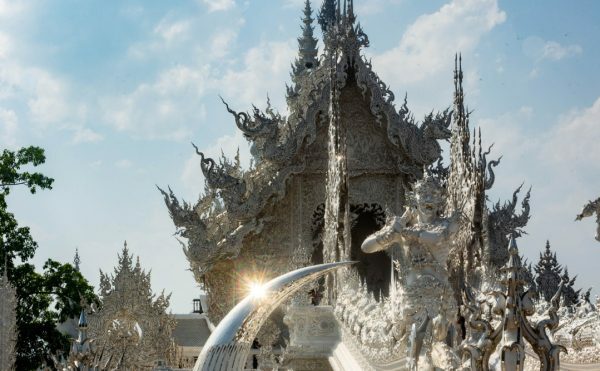 (Its scale, pristine condition and vibrant colors alone are practically worth the cost of admission.) The title, central figure, and even the color palette all pay tribute to that most indigenous of Louisiana musical traditions, which is itself a hybrid of French Creole, Cajun, African American, and Native American influences. With a similar disparate mix in his own ancestry, it’s not difficult to posit that zydeco would have appealed to Basquiat on a personal level. 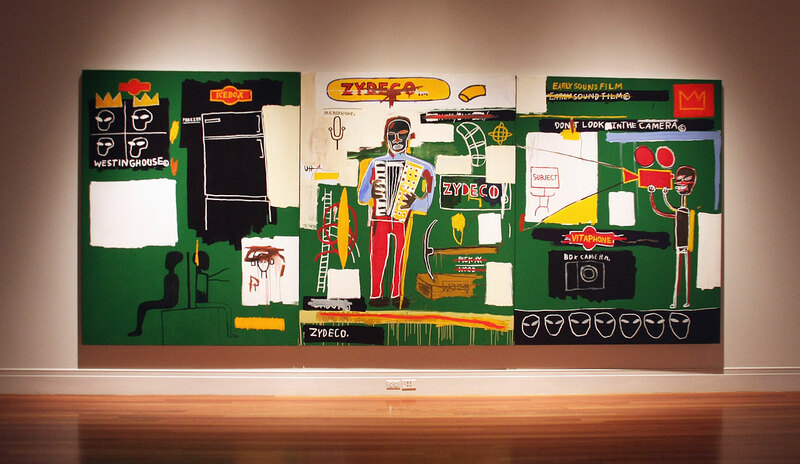 Aside from “King Zulu” and “Zydeco,” most of the remaining paintings in Basquiat and the Bayou announce their Southern associations in more subtle ways. Sometimes they’re a little too subtle: on the surface, there’s little of the bayou in “CPRKR” (1982), Basquiat’s tribute to jazz legend Charlie Parker. 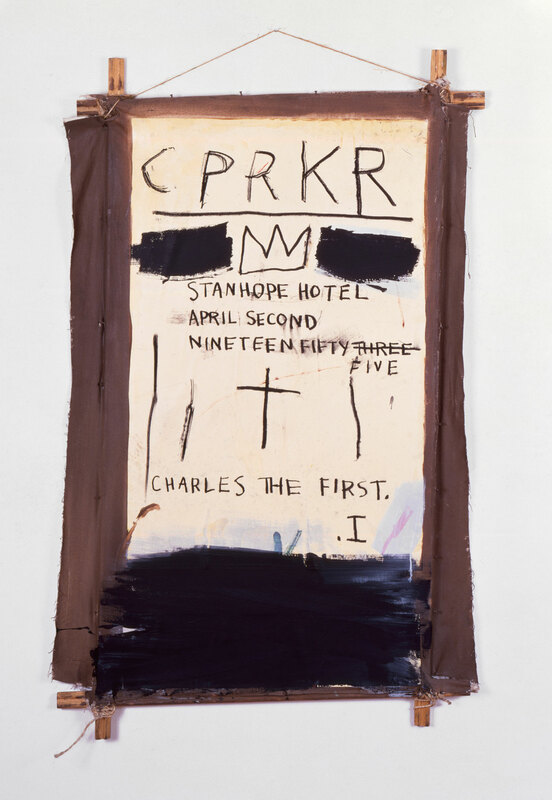 (As Sirmans points out, the date on the painting refers to a posthumous benefit performance for Parker at New York City’s Stanhope Hotel and not to the actual date of Parker’s death, as has been occasionally cited.) To Sirmans’s credit, however, the inclusion of “CPRKR” here doesn’t come across as padding but rather as a useful adjunct to the paintings (like the nearby “Zydeco”) that evince one of the exhibition’s themes (jazz music, in this case) more explicitly. And then there are a few works where the “Southerness” seems to amount to little more than the sort of the “name-dropping thing” which Basquiat copped to in his oft-quoted 1983 interview with Henry Geldzahler in Interview magazine. The title of “Natchez” (1985) references the “Queen City” of the Mississippi Delta and with its lists of names of jazz musicians, titles of blues songs, and music-related phrases (including the suggestive ”Soften it with an oboe”), the piece may be viewed as a sort of connotative textual portrait of a particular place: “a remix,” says Sirmans, “before such words had the associations they do today.” But the dozens of pieces of Xeroxed paper which comprise “Natchez” also include lists of zoo animals and sketches referencing solar phenomena, among many other things. 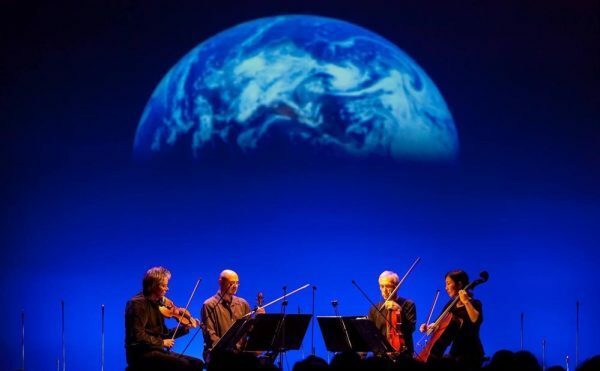 As a “remix,” then, if “Natchez” is “about” the South, or the Delta, or jazz music, it can just as easily be “about” any number of other things too. Likewise, the accordion player in “Embittered” (1986) is apparently all that’s needed to allow the painting to be viewed as somehow “Southern,” even though the figure is only one of several motifs in the piece (others include Beethoven’s “Eroica” symphony and professional boxing). In the context of the show, it’s tempting to view the assortment of figures on the right side of the panel — one of whom wears a giant Residents-esque eyeball on her head — as fantastic creatures sprung from a Mardi Gras nightmare. 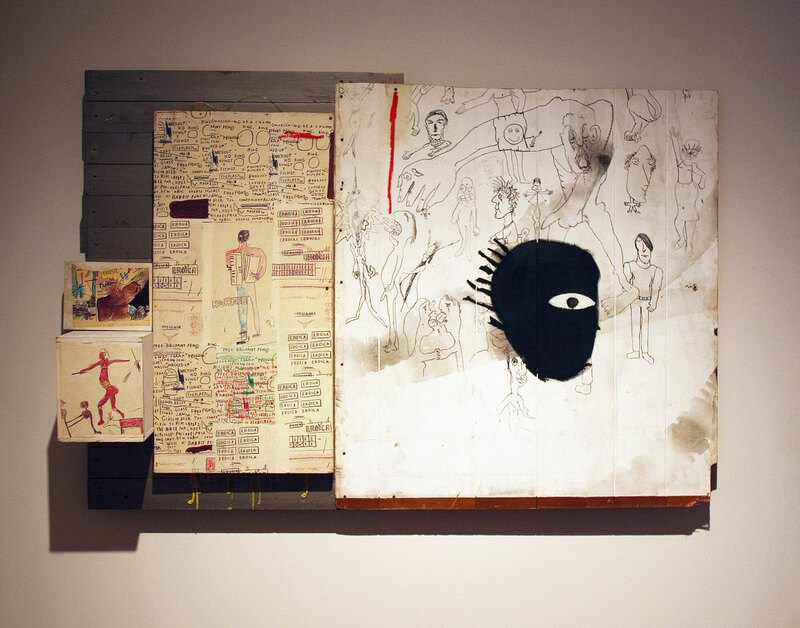 However, Basquiat found the panel with the figures already drawn on it by another artist and incorporated it into his assemblage. It’s a happy coincidence given the painting’s current display in New Orleans, but also a caution against reading too much “Southerness” into some of the paintings here — i.e., the kind of overreading that Basquiat and the Bayou occasionally brushes up against despite (or perhaps because of) its best intentions. 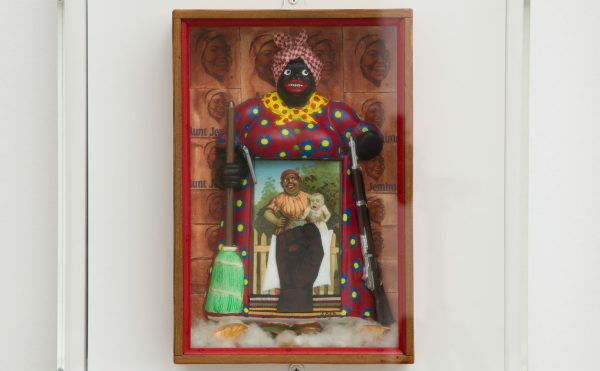 “Exu” is a name of the Yorùbá deity also known as Eshu, Elegba, Legba, and Papa Legba in various Afro-Caribbean religious traditions including Brazilian Candomblé, Haitian Vodou, and the Louisiana Voodoo practiced by descendants of West Africans bought to the New World as slaves. Under his various names and attributes, he is venerated both as a guardian of the crossroads and as the personification of death. Depicted in a frenzied riot of all-seeing eyes, spears, and offerings of rolled tobacco, Exu is a morbidly prophetic subject for a painting created a short while before the artist’s own death. 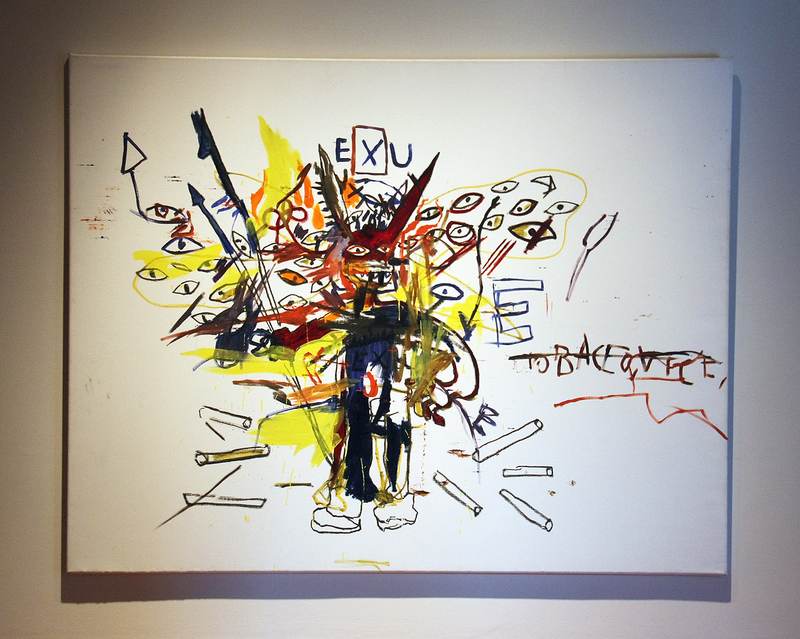 But it’s Exu’s role as the protector of travelers — not to mention his status as the “trickster” god — that even more appropriately marks him as a fitting emblem for Basquiat’s peripatetic eye and mischievous visual inventiveness. As satisfying as the nine paintings are as a group, Basquiat and the Bayou is almost as significant for what wasn’t included in the actual exhibition. The catalogue for the show features other works by Basquiat which also explore Southern themes — several of which, like “Jim Crow” (1986), do so more explicitly than the ones on view at the Ogden, giving a tantalizing suggestion of how expansive the show could have been in a world of low insurance premiums and unrestricted loan access. 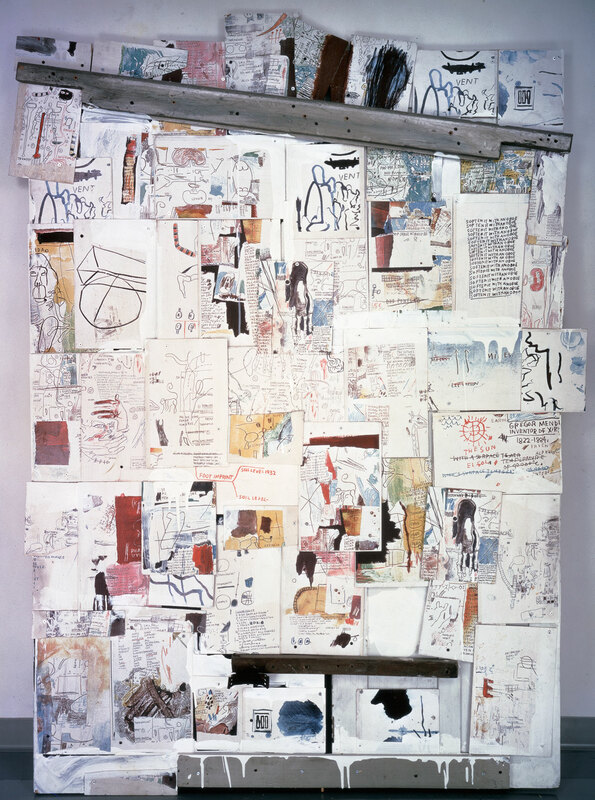 One painting in particular, the richly associative “Undiscovered Genius Of The Mississippi Delta” (1983), is listed in the catalogue as being part of the current show, but didn’t make the final install; the fact that it changed hands for nearly $24 million at Sotheby’s last May (which the chronology in the exhibition catalogue makes note of) may have something to do with it. Even in its attenuated final presentation, however, Basquiat and the Bayou provides a smartly organized model for the type of thematic exhibition his work deserves more of (just as Jordana Moore Saggese’s new Reading Basquiat: Exploring Ambivalence in American Art provides a new model for Basquiat studies in general), and an opportunity for a focused look at Basquiat’s work in a new context. It’s the crown on top of the Prospect.3 pile, and reason enough to visit New Orleans this fall. 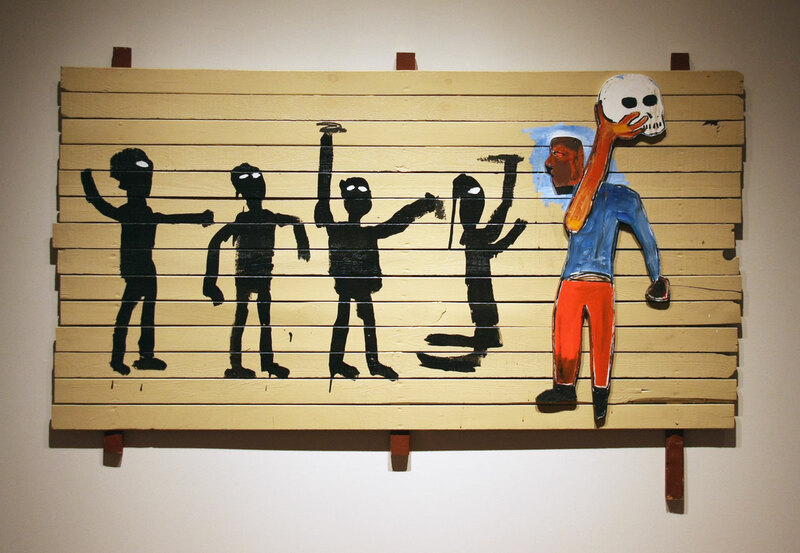 Basquiat and the Bayou is on view at the Ogden Museum of Southern Art in New Orleans through January 25, 2015 as part of Prospect.3: Notes for Now. Visit prospectneworleans.org and ogdenmuseum.org for more information.